Your kitchen should meet the three elements of lighting, which include ambient, accent, and task lighting. Consider switching pendant light fixtures above your kitchen table for a unique vintage light bulb installation that defies symmetry. 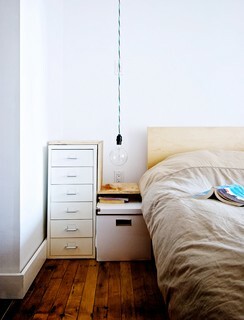 Use single wires to hang the bulbs at different lengths to make a bold statement above your table. Another option is crafting a chandelier using reclaimed wood, wire, and different styles of Edison bulbs hanging at a variety of lengths. If you want a more unified design, consider using clear pendant fixtures and hanging them evenly above the table. Using clear pendant fixtures allow the filament design of your Edison bulbs to show. Wouldn’t it be nice if your floor or table lamp could double as illumination and a conversation starter? That’s one less piece of artwork that you’d have to buy. You could ponder purchasing an industrial style steampunk light. The term “steam punk” describes a particular genre of science fiction that uses steam powered machinery instead of advanced technology. Steam punk lamps come in a variety of styles, but all of them typically use Edison style bulbs. If you’re feeling adventurous and consider yourself pretty handy with tools, you could even create your own. You could disassemble an old fan using a sand blaster, switching them out for vintage bulbs. Just keep in mind, that once the blades have been removed, it’s no longer a fan and should only be used for lighting purposes. Get the step by step process on Edison Nation. For those who aren’t the tool toting types, you too can have a lamp to love. First fill a large mason jar with an assortment of small pebbles or wine corks. Next, screw an adapter lid onto the mouth of the mason jar. Finally, screw your favorite style of Edison bulb in. You have the option of adding a lamp shade, or letting your Edison shine. Upgrade your outdoor or indoor event with the warm glow of Edison bulbs. Whether you’re interested in lighting a wedding or creating a unique ambiance for your dinner party, the vintage style takes your event to the next level. Try using a variety of different shaped Edison bulbs and individually stringing them at different lengths from the ceiling of your event venue. Go bold by incorporating oversized antique light bulbs! Operating at 60 watts, these bulbs have a gorgeous earnest glow and don’t require a fixture. If your gathering is outdoors, consider using patio light stringers with a medium E26 base. Replace the bulbs with medium based vintage light bulbs for something a little more interesting. String or drape them from a tree. If you’re a fan of modern home decorations, you may want to combine a simple cord with a large G25 glove style bulb to create a simple yet sleek reading lamp. It should be noted that before creating your new reading light, you’ll want to carefully measure the ceilings so that you don’t hang the bulb too high or too low. No one wants to play the jumping game trying to turn off a light before dozing off after a good read, or bump the old noggin while putting on house shoes in the morning. That’s no way to live. Besides capturing diners with amazing food, it’s important for restaurants to maintain a spectacular atmosphere. Lighting plays a major role in setting the mood, presentation of the food, and even management of the restaurant, which we discuss in a previous article, entitled The Importance of Restaurant Lighting. The use of Edison bulbs in a restaurant can help elevate the romantic mood and even draw guests’ attention. Some restaurants, including [restaurant] hang multiple vintage bulbs throughout the dining area. Others may consider going for more artistic installations, or hanging the bulbs near the checkout, bathroom, or bar area. The possibilities are endless. Whether they are used to bring a little retro glow to your kitchen or to enhance the ambiance of a restaurant, Edison bulbs are a great way to compliment your décor. Find out if Edison bulbs are bright enough for your installation in our earlier blog post. What are some of your favorite ways to use these vintage light bulbs? Feel free to leave your response in the comments section below. As always you can drop us a line on Facebook, Twitter, GooglePlus, LinkedIn, or Pinterest.